Over the last few days, rather than updating my blog or getting around to reading those two atmospheric model papers, I have spent my free time playing either Bioshock 2 or Dante's Inferno on the Xbox 360. Now of the two, Dante's Inferno would seem to have the most connection to Io. Bioshock 2 is set in a dystopian underwater city in the late 1960s would probably have more connection to Europa. 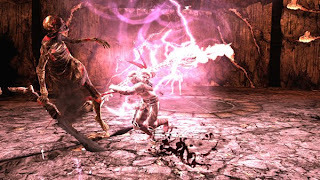 EA's Dante's Inferno is a very, very, very, very, very, VERY loose adaptation of the first third of the Italian epic poem, The Divine Comedy by Dante Alighieri, written between 1308 and 1321. The game isn't for everyone, like anyone younger than 40, with all the dead, blade-wielding, unbaptized babies and dead prostitutes with projectile anatomies you have to fight. The original poem by Dante has been used as the source for names for several features on Io. 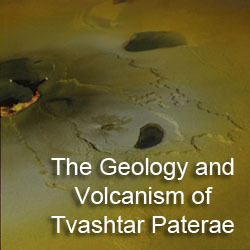 The names of people and places from Inferno can be used for mountains, bright regions, layered plains, and shield volcanoes. This change came about in 2000 as a result of the previous source of names for these features - people and places from the Greek myth of Io - had become exhausted. With the abundant number of shades (souls condemned to limbo or hell proper) and places referenced in Dante's original story, it should take quite a while before this source is exhausted. Dante's Inferno was chosen as a source for names for Io was Io's extreme volcanic activity that in many ways share similarities with Dante's description of hell, with fire (in the form of lava) and brimstone (another word for sulfur). To date, three feature on Io have been named after people or places mentioned in Inferno: Capaneus Mensa, Bulicame Regio, and Mongibello Mons. Capaneus Mensa is large, mitten-shaped domical plateau in southern Bosphorus Regio in an area with a high density of mountains, such as Seth Mons to its northwest. Capaneus Mensa is at least 5.2 kilometers tall based on shadow measurements of its eastern margin, however, stereo data from Galileo suggest a height of around 9.2 kilometers, making it one of the taller mountains on Io. 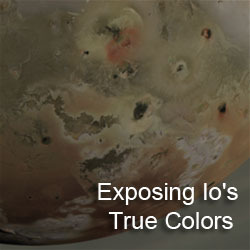 Bulicame Regio is the northern extension of Colchis Regio, a bright, equatorial region on Io's anti-Jupiter hemisphere. Bulicame, which lies to the Isum Patera volcanic region, has a higher albedo than the rest of Colchis Regio and its morphology suggests that it might be a bright lava flow, possibly composed of sulfur dioxide. High-resolution images taken during I27 revealed dramatic, fine-scale albedo variations across parts of Bulicame, with some evidence for layering. 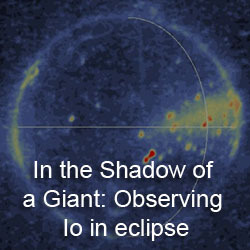 Mongibello Mons is a 7-kilometer tall double ridge on Io's leading hemisphere. A medium-resolution frame was acquired over portions of Mongibello during Galileo's I27 encounter in February 2000. The split morphology of Mongibello is suggestive of tectonic deformation of the feature after formation, resulting in one of half of the mountain breaking off from the other half. The original The Divine Comedy chronicles the story of Dante, a poet from Florence who has become afraid that he has lost the path to salvation as a result of his own imperfections, largely a result of the author's own sense of loss after being exiled from Florence due to political infighting among the city's ruling Guelph party. The spirit of a dead childhood friend, Beatrice, enlists the help of the Roman poet Virgil to guide Dante through the afterlife, Inferno (hell), Purgatorio (purgatory), and Paradiso (heaven) to help get Dante on the right path (diritta via). In Inferno, Dante and Virgil visit each of the nine circles (plus Limbo) of hell, wherein each a different sin is punished in a sort of poetic justice, e.g. fortunetellers can only see the path behind them and murderers stand within a boiling river of blood at a depth corresponding to the extent of their sins. The names for all three of the Ionian features described above come from Inferno XIV, the 14th "chapter" or canto of the Inferno part of The Divine Comedy. In this chapter, Dante is traversing the seventh circle of hell where those who committed grave acts of violence: against people and property (in that boiling river of blood); against self, be it through suicide or wanton waste of material possessions (where the suicides are punished by becoming heavily overgrown trees); and against God, nature, or established order. 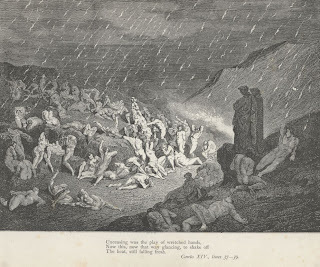 It is this last section of the seventh circle, a burning desert where those who committed violence against God (blasphemy), violence against nature (homosexuality), and violence against order (usurpers) are punished, that Dante visits in Inferno XIV. Dante had just come out of the overgrown forest of the suicides, and he and Virgil follow along the margin between the forest and the burning desert to keep Dante from burning himself. While following this path, he comes across Capaneus, the soul of a mythological Greek warrior who participated in the "Seven Against Thebes" siege, lying on the burning sand (oh did I mention that fiery embers are falling from the sky too...). Capaneus, his arrogance and pride being so great, proclaimed at the gates of Thebes that not even Zeus could stop him from taking the city. For such blasphemy, Zeus struck him down with a thunderbolt created within Hephaestus' (or Vulcan to the Romans) forge in the crater of Mount Edna in Sicily. In Dante's conversations with Capaneus, the volcano Mount Etna is referred to as Mongibello, meaning the "beautiful mountain" in Italian. After passing the clearly unrepentant Capaneus, Dante and Virgil reach a stream of blood connecting the Phlegethon to the frozen Cocytus in the ninth circle deep below. The two poets later travel along the dikes that keep the blood in its channel in order to traverse across the otherwise harsh, burning desert. Dante compares this stream to the Bulicame, a hot sulfurous spring near Viterbo from which prostitutes in the town drew their water for their own homes since they were likely prohibited from using the public baths. With plenty of names from Dante's Inferno available for use on Io's many mountains, we should see more names and places from the poem to be added to Io's infernal surface features. I always thought the names of the Malebranche from the eighth circle would make a good fit for Io's mountains. Come on, don't tell me you don't want to see a Barbariccia Mensa. Now the question remains....do you LIKE Inferno? Because I was thinking of getting it, and after finishing Uncharted 2 I'm seriously lacking in a good PS3 game to chew on. Plus I like the "Ain't No Sunshine When She's Gone" TV spot. It isn't too bad. There are a few infuriating section that require some tricky and well-timed jumping, but overall I am having fun playing the game. That being said, the 360 also didn't get God of War, so this type of game is new to me, but to someone with a PS3, I'm sure it comes off as a God of War reskin. Bioshock 2 has been pretty fun too. It kind of looked like a God of War thing. Wipe out a horde of enemies encircling you with a reach weapon. Over and over and over. I'm cool with it if the storyline and scenery is well done, but if it gets too repetitive I'll get bored with it. Oh well, that's a discussion for other blogs.